New Winter 2018: You’ll get grins and truck noises when your little guy or gal opens this kids ornament personalized just for them! The Danny the dump truck personalized Christmas ornament stars a robust hauler that combines features of a toy truck with those of an animated character. Some parents add this cute kids ornament to the top of a gift when a Tonka Truck or similar toy is inside. These are personalized girls and boys ornaments, so we’ll add the child’s name in front using a stylish font and a longer message on back, at your option. 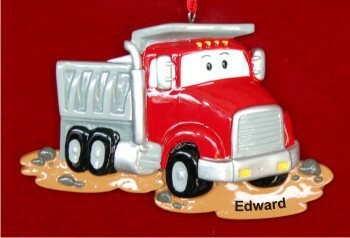 Add fun to the tree this Christmas with the red dump truck personalized ornament!